The evidence is growing that the improvements in imaging, along with increasingly conformal radiation treatments, are providing significant benefits for patient outcome, both in terms of tumor control and reduced normal tissue complications. The challenge is for medical physicists and radiation oncologists to stay "in tune" with these rapidly changing advances that provide a better quality of life for patients. The goal of The Modern Technology of Radiation Oncology is to provide state-of-the-art, updated information on making these technologies available in the clinic. 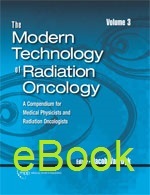 The Modern Technology of Radiation Oncology series has become a reference around the world for practicing medical physicists and especially for the medical physicists who are sitting their certification exams.